I have been seeing much more fringe lately, and I am absolutely head over heels for it! You can rock a bit of fringe with your outfits without looking like a hippy. Here are some pieces to get you started! This skirt is only $24.99! A perfect way to experiment with fringe at a budget-friendly price. For under $40, this would pair fabulously with a plain black shirt (as pictured). This skirt additionally comes in black! (NYE, anyone?) The scalloped-hem bottom is extremely on trend. Another H&M stunner, in gray, for under $40! This gray skirt would pair nicely with any white or black top. Add black tights and pumps, and you have the perfect look incorporating fringe! The layers in this black skirt are so adorable! For $32, this J. Crew Factory top would look lovely with skinny jeans and pumps! Try glittery heels with this top in navy or black-- an ideal holiday party look! I can't decide which I love more! Since fringe detailing is likely to be a hot trend, you may not want to spend a lot of money on it. However, if you are looking to make a bigger investment, here are some ideas for you! The chevron pattern to this skirt is fabulous! This dress also comes in an all-black version. Just GORGEOUS! Similar to sequins, pair fringe with a very basic, polished top or bottom. The main piece is the fringe; don't let your top or bottom take away from that! 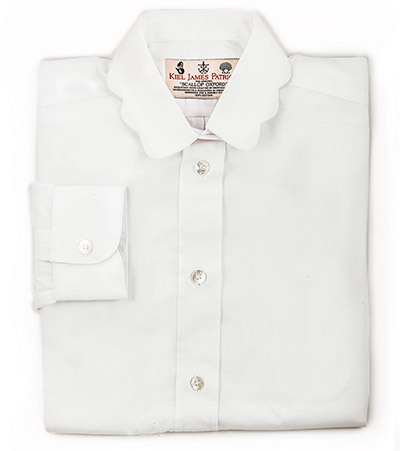 Be sure it compliments the fringe nicely-- opt for a chambray button up or crisp, white oxford. The Scalloped Oxford from Kiel James Patrick would be an excellent option to pair with a fringe skirt. How are you including fringe in your wardrobe this winter? I can't wait to head to H&M to pick up a fun new skirt!